Ever since the Civil Rights era the city of Atlanta has often dubbed itself the “city too busy to hate.” Now that the city is in the throes of this generation’s protest, Atlanta seems to be adopting that moniker once more. Check out this inspirational video from 11Alive created after NAACP led protests in the city. A “city too busy” proved to be a useful rallying cry for many in the city during the turmoil of the Civil Rights movement and after. You can listen to an old interview here, where 1960 Atlanta Mayor William B. Hartsfield makes the claim. In the 1990s, this myth became useful once more in Atlanta’s bid for Olympics. Although Atlanta was not as violent as Birmingham, it did see its fair share of racist atrocities. There is overwhelming evidence which proves that Atlanta was really more of a city too busy to care. That its attempts at progressive racial stances was more of an attempt at apathy. However, Atlanta Mayor Kasim Reed seems to stand apart. Here’s what he has to say about the protest (Full interview from the above video). Mayor Reed does not use the moniker “…too busy to hate” as featured in 11Alive’s video which includes parts of this interview, but he does seem to embody the phrase’s antithesis. Mayor Reed is not too busy to care. For the past several nights, protests in Atlanta have been carried out in a peaceful manner for the most part. Arrests have been few and far in between. Law enforcement agents of the Georgia State Patrol and Atlanta Police Department have maintained civility and have refrained from acting in a militant manner. The only points of tension have arisen over the Freeways. Like Mayor Reed says in the video, the protesters are allowed to march and voice their opinion but they are not allowed access to the interstate which flows through Atlanta (I-75, I-85, I-20). In fact, the majority of arrests made during the protests come from this point of tension, when some of the protesters attempt to march on the interstate regardless of warnings. The Atlanta Mayor does state something rather interesting in his interview about Dr. Martin Luther King, Jr; that he would never take a freeway. A lot of Facebook commentators have responded negatively to that comment. 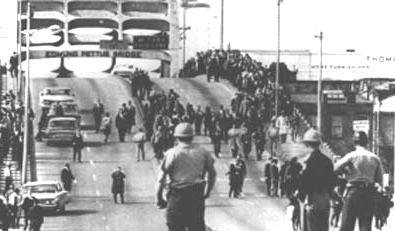 Some people used the comment to paint the mayor in a negative light even accusing him of being a “token black leader.” A few comments contained a famous Civil Rights photo featured here, which depicts the civil rights marchers crossing the Pettus Bridge in the infamous Selma to Montgomery March in 1965. It should be noted that the bridge is not on an interstate but actually a part of Hwy. 80. In fact, pretty much the entire Selma to Montgomery March took place on Hwy. 80 (Below). It did get me wondering about whether or not King would shut down a freeway. Click here for NPS site. I spent a short time research whether or not Dr. King ever marched on an Interstate. I could not find much of anything on the topic from King’s own mouth or even examples. However, Congress passed National Interstate and Defense Highways Act in 1956. That’s only two years before Brown v. Board. I’m not sure how much of the interstate the government finished by King’s death in 1968, but the 1955 map below does show how much of the interstate the government intended to have finished by 1965. I’d probably argue against the mayor on this topic, but my answer would be more of an “I don’t know.” Many of the lines were under construction and not in use, so a march on those roads would not make much difference. There is also no interstate route between Selma and Montgomery. Although King’s home of Atlanta definitely had branches of the interstate flowing through by the 1960s, King never seemed to demonstrate on them. I guess it’s a half truth, although King probably never shut down a freeway he also did not have the access to it like we enjoy today. However, I do think Mayor Reed’s heart is unquestionably in the right place. Atlanta’s leaders are not too busy to care.